The peculiar-looking fawn has the cutest coloration: a white face, pink nose, and a beautiful coat that’s a mixture of brown and pure white. 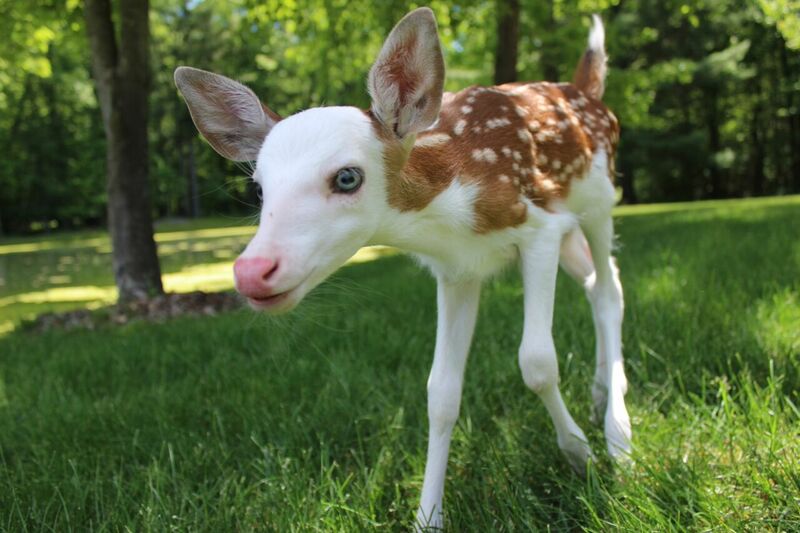 But the white-faced baby deer has somewhat of a sad story: Because of his piebald face, he was rejected by his mother, leaving the owners of Deer Tracks Junction in Cedar Springs, Michigan, to care for the animal. The 2-week-old deer, who was born at the farm, is named “Dragon,” and has learned to prance and frolic like other young deer at the educational and tourism facility. Piebald deer, which boast this type of odd coloration, are rare in captivity and extremely rare in the wild. It’s more of a detriment because they lack the appropriate camouflage to hide from predators. This helps to explain why Dragon’s mother disowned the fawn hours after he was born—because her natural instinct demands that she be able to hide from predators in order to survive. But Dragon is fortunate to have Powell as his surrogate mother. Deer Tracks Junction opened to the public on Wednesday, but Powell, who has been feeding Dragon and giving him vitamins, said it might be several days before is ready to be placed on public display.